This crispy chicken sandwich makes a scrumptiously filling lunch. Courtesy of Oleg and Gene Voss of Schnitzel & Things. 1. Flatten the chicken cutlets in between two pieces of saran wrap. 2. In three separate shallow bowls, place the flour in one bowl, combine the egg and milk in the second bowl, and the breadcrumbs go into the last bowl. 3. Coat the meat with the flour, then dip into milk/egg mixture and finally into the breadcrumbs. 4. 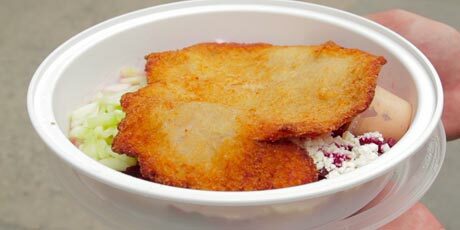 In a large skillet on high heat, fry the chicken schnitzel for approximately 1 minute per side. This eggs Benedict recipe uses classic latkes as the base, instead of the more common English muffin, and skips the ham for rich smoked salmon. Cinnamon-spiced chocolate snickerdoodles come together with an almond cherry chip cookie for a festive flavour palette that is sure to impress. Think you have what it takes? ?Be on a?Food Network?Canada show! See what shows are casting today. © Corus Entertainment Inc., 2018. All rights reserved. Corus Lifestyle.